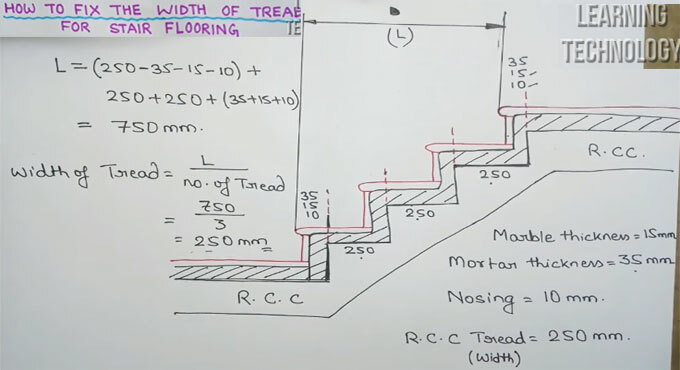 In this construction video tutorial, one will learn how to settle the cutting length of width of tread marble for stair flooring. It should be remembered that no guess work should be accomplished for stair flooring. In stair flooring it is difficult to estimate the riser and tread and so estimation should be created cautiously. Besides, every tread in a stairway should be calculated equivalently. If significant differences among the treads occur in a stairway, there will serious safety issue. TREAD : Tread stands for Horizontal section of each flight. RISER : Riser stands for a vertical measurement of each flight. To get more clear information, go through the following construction video tutorial.